EIGHT TIMES in a row Improved Production has been an important class on the support program to the Bathurst 12 Hour and 2017 will be no different. The popular category will be again (for the fifth time) have Donut King as the naming rights partner, along with support from Yokohama and Bilstein and has more entries than available grid spaces. 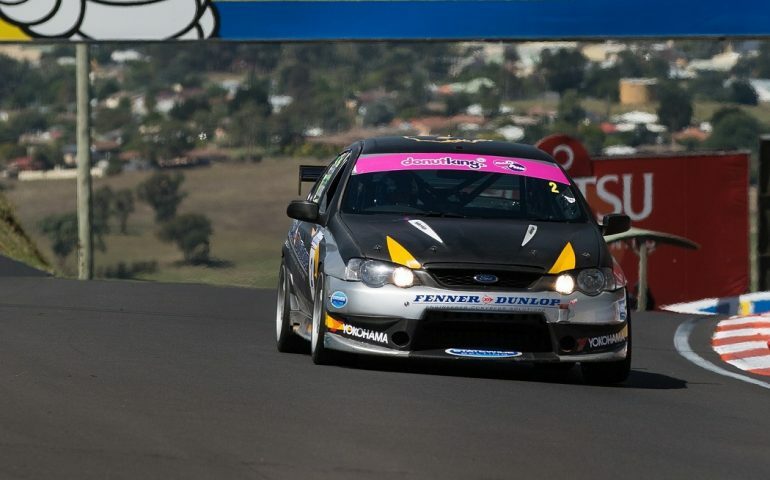 The 58‐strong entry list is headed in the Over Two Litre class by five‐time Nationals winner and current number one plate holder, Tasmanian Ray Hislop and his Ford Falcon BF V8. The combination has had half a dozen dominant race wins on the mountain, but by the same token Hislop has suffered mechanical issues and two crashes that have denied him several more victories. On those occasions South Australian Tony Wallis (Mazda 808), Victorian Ben Schoots and Queenslander Simon O’Dell‐Fontana (Mazda RX7s), Victorian Ric Newman (Falcon V8) and Anthony Loscialpo (Holden Commodore) from NSW have taken the honours. In 2015 it was the West Australian Matt Cherry who took both wins, taking his Holden Monaro from 27th place to victory in race one and then pipping category stalwart Leigh Forrest by just 0.06secs in the second outing. Cherry backed up to take overall honours last year after race one winner and tearaway leader Hislop tangled with a lap car in the second outing. Hislop had just set a stunning new IP lap record of 2 minutes 20.1080 seconds which would have put him fourth on the grid for Combined Sedans featuring far more modified Sports Sedans and V8 Touring Cars. Forrest also from Tasmania, has won twice previously in his Toyota Celica Turbo and has finished second on seven occasions. He will again throw out the challenge along with Cherry and fellow West Aussie Kerry Wade (BMW E30. Queensland is well represented with the likes of Daniel Cliff (Holden Commodore), Justin Wade (BMW E90), Beric Lynton, Tony Alford (BMW 1Ms) and Kyle Alford (Audi TT RS), and some quick Victorians are on the way including Damien Milano and Scott Wilson (Holden Commodores), and Robert Braune and Phil Showers in their BMWs. Competitors are coming from far and wide and include Barry Smith (Holden Commodore) and John Newman from the Northern Territory, and also South Australians Michael Naguib (Datsun 1600 Turbo), Craig Manuel (Mazda 808) and Roger Vanderkamp (Ford Falcon XY GT). The home state will be well represented with Peter and Matt Ingram (Mazda RX7s), Michael King (Mitsubishi EVO 8) and Brian Anderson (BMW E46 M3) among many wanting a NSW victory. The Under Two Litre class should also be hotly contested with the fastest cars likely to sneak into the top ten overall. NSW’s Scott Hunter (Corolla) and Jordan Cox and Graham Bohm in their Honda Integra are the picks of the ones to watch. The Donut King Improved Production Bathurst Challenge cars are scheduled to hit the track for the first time on Friday, February 3 at 10:45am for a practice/qualifying session before race one at 3.25pm over ten laps. There will be two further races on Saturday, February 4 at 10:00am and 3:00pm.